kickstART includes a Live Paint Battle, hands-on art activities (buttonmaking, create a bookmark, The Wings Project), music, snacks, and prizes! FREE! 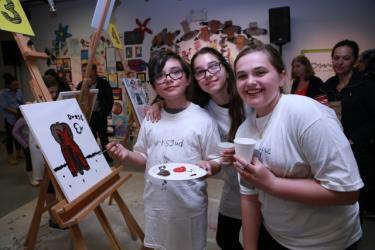 LIVE PAINT BATTLE – A live painting competition for youth at Latcham Art Centre. This free, live painting event invites individual artists and/or collaborative artist teams (maximum 2 people) ages 11-18 to compete in a timed ‘paint off’. Winners of each round go on to compete in the final ‘paint off’. Winners are selected by the audience, and in the case of a tie, decided by an external juror. Everyone is invited to attend and cheer for their favourite artist and teams! Registration for the Live Paint Battle opens Wednesday, April 3. To register for the Live Paint Battle, email your completed form (found at our website) to events@latchamartcentre.ca or drop it off in person at Latcham Art Centre (located in the Leisure Centre at 2 Park Drive). Registration can also be taken over the phone.